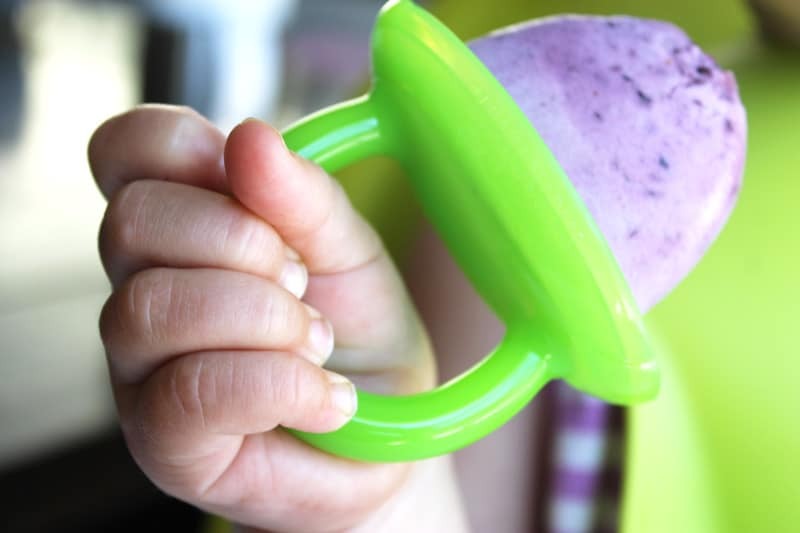 Blueberry Coconut Popsicles: A nutrient dense summer treat for kids! High in good fats from the coconut milk, full of antioxidants from the blueberries, and sweetened with just a touch of pure maple syrup. This blog might turn into a popsicle niche before the end of the summer at the rate I am coming up with new varieties of popsicles. I just can’t help it though — they are so easy to make and the kids absolutely love them. After making the Strawberry Lime Popsicles I got the idea to turn these healthy treats into a nourishing snack. With the addition of full fat organic coconut milk these popsicles are much more filling for growing children. Read the ingredient label carefully when you buy coconut milk because (especially for kids) it is important to avoid guar gum and other thickeners (e.g. carrageenan). 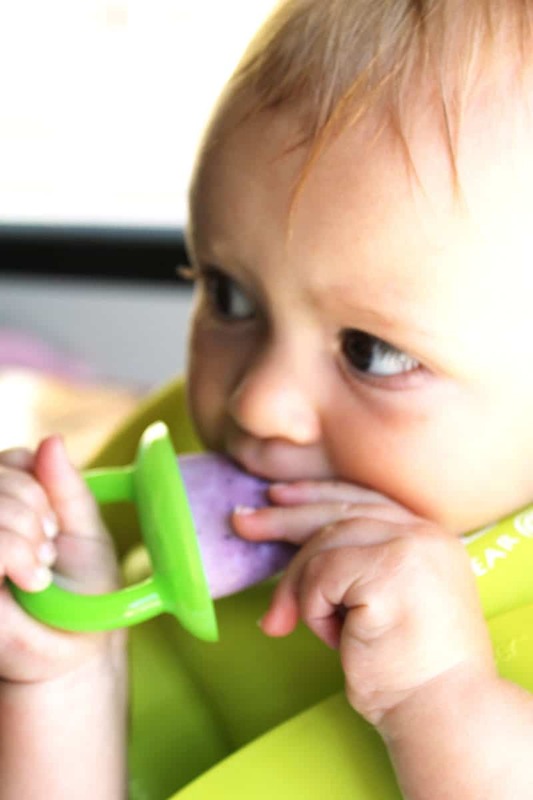 My research has concluded that small amounts of guar gum is probably not going to cause harm in healthy children but that it is best avoided (particularly in children who are prone to constipation). I buy canned coconut milk in a BPA free can; the cheapest organic, non-BPA, guar gum free brand that I have found is Trader Joe’s (~$1.50/can). You can find another guar gum free brand on Amazon, here. Coconut milk is also easy to make yourself; learn how here. Cartoned coconut milk usually has added sugar (make sure to select unsweetened) and watch out to make sure they haven’t added folic acid or synthetic vitamins to the milk. You can read more about the dangers of folic acid (a synthetic form of folate) for pregnant women and children here. I personally take MegaFood Baby & Me 2 prenatal because it is made from food, contains folate in the form of 5-MTHF (which means it has been methylated; this is especially important for individuals with the MTHFR genetic mutation), and does not contain any added herbs. You can learn more about prenatals from Mama Natural. Another great addition to these Blueberry Coconut Popsicles is collagen powder. Collagen is an insoluble protein that accounts for 1/3 of the protein in our bodies and 70% of the protein in our skin; it has multiple health benefits including joint repair, boosting the health of skin, hair, and nails, helping to heal leaky gut, improving metabolism, energy, muscle mass, and reducing stretch marks/cellulite. I have started adding 1-2 tablespoons of collagen to my more recent popsicle batches in an effort to incorporate collagen into our daily eating habits. 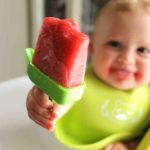 It is easier to use collagen powder than gelatin in recipes like popsicles because collagen powder is soluble in cold liquid and it is almost tasteless (easy to slip it in unnoticed!). Great Lakes is the brand we buy because it is from grass-fed cows, has a good reputation, and the price is about half of other leading brands. Vital Proteins is another well know, trusted grass-fed brand. I made grain free Carrot Cake Cupcakes (minus the frosting) for the kids this week in addition to the popsicles and it was a huge hit. The recipe is from a cookbook that I own and love called “Against All Grain: Meals Made Simple” by Danielle Walker. It looks like a blogger reposted Danielle’s recipe (the instructions are bit different) here as well. Don’t forget to pin these BLUEBERRY COCONUT POPSICLES to your favorite PINTEREST board for later! A nutrient dense summer treat for kids! High in good fats from the coconut milk, full of antioxidants from the blueberries, and sweetened with just a touch of pure maple syrup. Put all ingredients in blender. Blend on medium-high until smooth. Pour into popsicle molds and freeze minimum of 2-3 hours before serving. This recipe makes about 3 cups worth; the amount of popsicles it makes depends on the molds you have. For me this makes 6 "baby" popsicles (shown in pictures) and 8 full size popsicles (large size can be viewed here). If you are only making baby popsicles you might consider making only a third of this recipe. 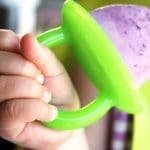 Munchkin Freezer Pops: Kids love ’em. Vitamix Blender: a high-powered time-saving wonder machine.